One of the most common terms used by activists is “the system.” It’s a difficult phrase, because it’s born from difficult circumstances. If there isn’t just one large problem, but rather several smaller, interconnected problems, then there is a system. Of course, being able to describe all of those interconnected aspects takes some hard work, as well as skill at communication. Too often, “the system” is depicted as a scapegoat, often by people who aren’t able or willing to communicate something that may be impossible to communicate anyway. So when a documentary comes along that successfully explains one of those systems of oppression and does it in a fashion that is both historically compelling and applicable to other situations, it’s an impressive achievement. Slavery By Another Name does just that, detailing the mechanisms by which African-Americans in the South were oppressed after the Civil War and their supposed emancipation. The degree of difficulty is higher than normal, because this is a chapter of American history that is under-discussed in general. American students are taught that there was slavery, and it was bad. Then there was the Civil War, which ended slavery. What happened next is generally glossed over: There were the Klan, and Jim Crow laws, which told African-Americans they couldn’t vote, until the Civil Rights movement, which fixed those problems. Slavery By Another Name takes the gloss off of the post-Civil War era, detailing exactly how racist white southerners created a system of oppression that not only harmed the newly emancipated blacks legally and economically, but created a social system that continues to have major ramifications on African-American society. The doc starts with the violence against blacks in the post-war South, generally perpetuated by poor whites who saw the freed slaves as economic competition. Congress then began Radical Reconstruction, which made equality more mandatory than many of the southerners wished. This is probably the documentary’s weakest aspect, since it moves past the potential gains of Reconstruction too quickly. By gliding past what was lost in too short at time, Slavery By Another Name doesn’t necessarily make a strong enough case that Jim Crow oppression wasn’t a historical inevitability. But that’s a minor problem compared to what it does do. The key component of the recreation of slavery-like circumstances in the South was the law. Southern states enacted a series of laws that essentially criminalized behavior associated with blacks (walking next to railroad tracks! Not having proof of employment! ), and applied those laws specifically to African-Americans. 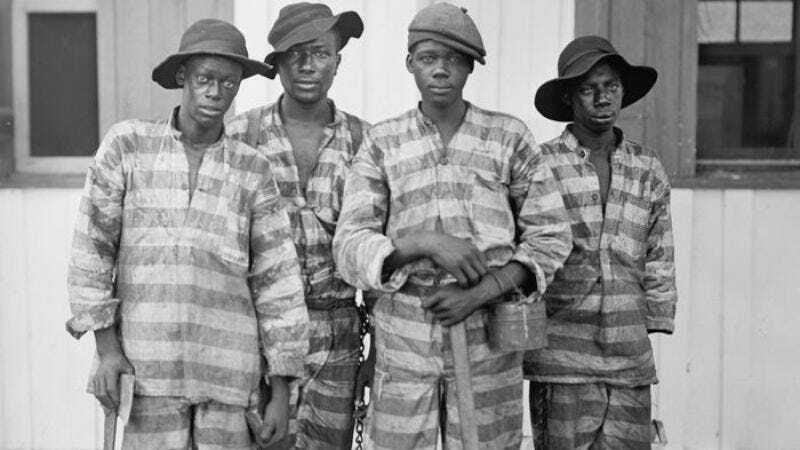 Once arrested, the blacks were swiftly convicted and then placed into work groups, which were leased to corporations and landowners to work. Those new owners could work their new slaves as hard as they wanted at whatever they wanted, with a 30-40 percent mortality rate. At a certain level, this was actually worse than antebellum slavery, as some of the historians interviewed say, because slaves were long-term investments. Convicts on month-to-month leases could be used and disposed of at will. In order to justify this, society created a series of new stereotypes about African-Americans. As one talking head describes, even into the 1870s, the typical perception was that blacks were loyal. When it became part of the racist society’s self-interest to turn them into criminals, a propaganda effort started depicting blacks as criminals, incapable of being civilized. It’s almost impossible not to look at these arguments through a modern lens, with the Drug War, three-strikes rules, and prison labor. To its credit, Slavery By Another Name doesn’t try to make those lessons clear, but it’s impossible not to see the sins of the present as those descended from the past. This isn’t the only thing Slavery By Another Name does well, but to go into so many details would belabor the point. The Jim Crow era of the South is one of the major, undiscussed components of American history. By discussing it, Slavery By Another Name does a good deed. By discussing it so well, Slavery By Another Name does an important deed. “He sold him to another man” is how it opens. Yes. That’s slavery. Woodrow Wilson comes across as quite a villain, not only ignoring Southern segregation, but adopting it for the federal government. You know it’s bad when chain gangs were considered “reform” of the penal system. Convict labor only ends after the death of a white man beaten by his overseer.